My mother-in-law and I grabbed lunch at Cafe Borrone today. It was guuh-uuhd. We also got $25, 1-hour massages at Happy Feet foot spa in Palo Alto. That was also guuh-uuuhd. We ladies are livin’ the life today. Not looking forward to Pat’s departure on Saturday! If you live in the Bay Area…I highly recommend you re-create my day. Cafe Borrone is always delish. And Happy Feet is my new fave!!! 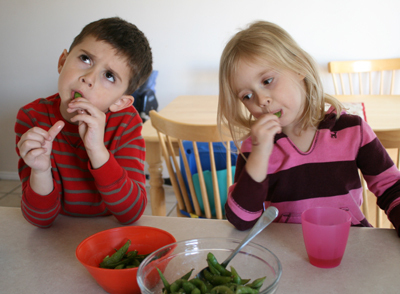 Guest Blogger Marie LeBaron: Edamame! I am happy to introduce Marie from Make and Takes as today’s guest blogger! Marie is one of the bloggers I had the pleasure of meeting in person recently and she is as sweet as she is impressive. I love having her for a guest post since she is so talented at creating kid-friendly activities and snacks…which brings us to her post. Thanks, for visiting, Marie! I’m happy to be a guest today as This Week For Dinner is one of my favorite food blogs! I love Jane’s Weekly Menu, it’s always giving me good ideas for what to eat. 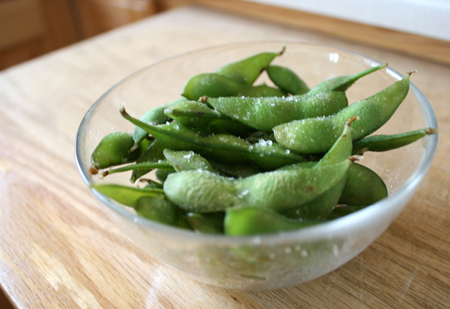 Today I’m sharing one of my family’s favorite healthy snacks, Edamame! Have you tried it before? Edamame are soybeans in pods. You don’t eat the pod, just the yummy soybeans inside. 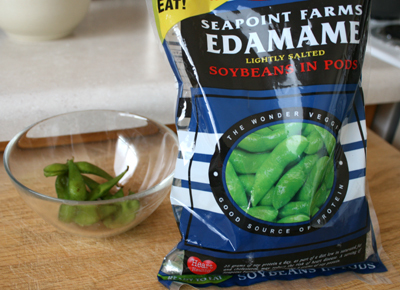 My kids and I can gobble a whole bag of Edamame in minutes. They’re a simple snack, fun to eat, and good for you too. You can buy Edamame all ready to go in the freezer section of your grocery store, they even sell big bags of them at Costco. Place some in a bowl and follow the directions for cooking/steaming on the bag. I also like to add salt to mine, making for an even tastier treat. Now pop the pod in your mouth and squeeze out the soybean. The salt on top of the pod will give your soybean more flavor. Then discard the pod into a bowl. 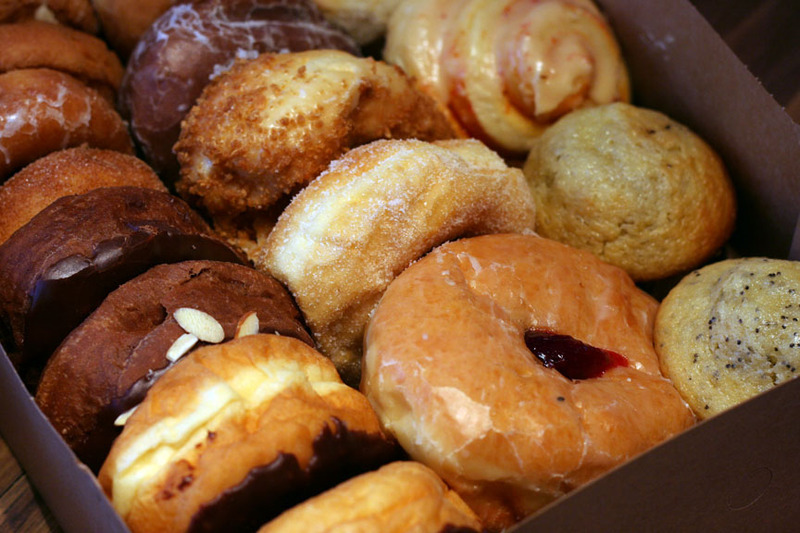 I dare you to eat just one of these, I promise you won’t be able to stop! As I’ve mentioned, my in-laws are in town. We were exploring yesterday and drove by the Allied Arts Guild down the street from where we live. We always figured it was some sort of artists’ colony and never took the time to really check it out. Yesterday, as we drove by, we noticed a “Public Welcome” sign. We finally stopped to explore. It was so cool. Boutiques, working areas for artists, a restaurant and BEAUTIFUL grounds. I can’t believe I’ve been living literally steps away from such a lovely spot for nearly a year. So…my challenge to you this week…discover a hidden, beautiful place where you live. I promise it’s there. Maybe hiding behind a stone wall as mine was. Or perhaps a little art gallery down the street. Whatever it is, it’s there. Take a minute to notice, really look closely. You’ll be happy you did. It’s turned into a stormy weekend. 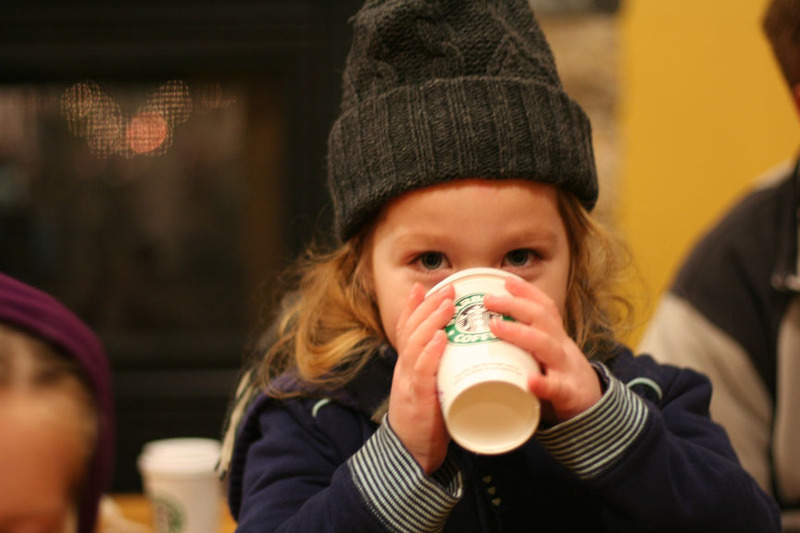 I think some hot chocolate is in order. This coming week is going to be FUN. My in-laws are coming to town…and, lucky for me, that is a great thing! I’m planning a menu, but I doubt will be sticking to it. It’s your turn! Please share your menu for the week! The Bane of My Kitchen Existence…Dishes. I HATE DOING THE DISHES. This card sent to me by my mother-in-law hangs on my fridge to reinforce that fact every day. I think the greeting card writer must have overheard me muttering these words one day and thought, “Hey! 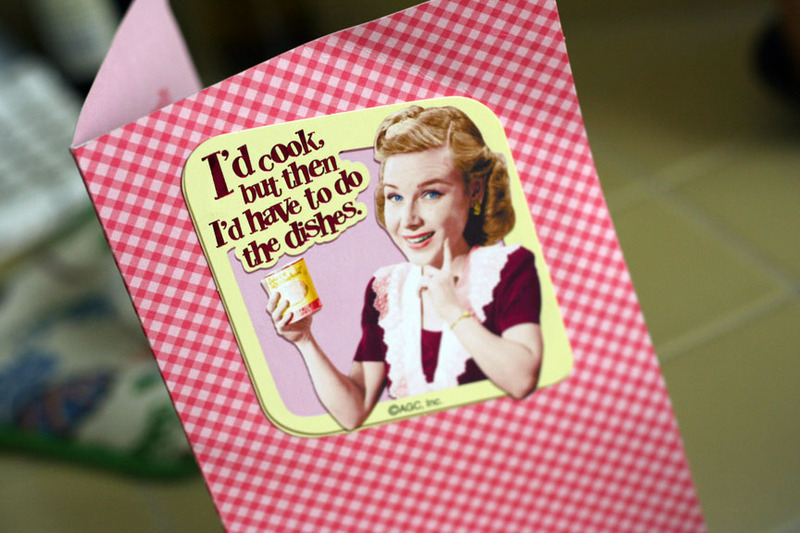 That would make a funny mother’s day card!” I’m expecting royalties. Wanna know the weird part? They’re clean. 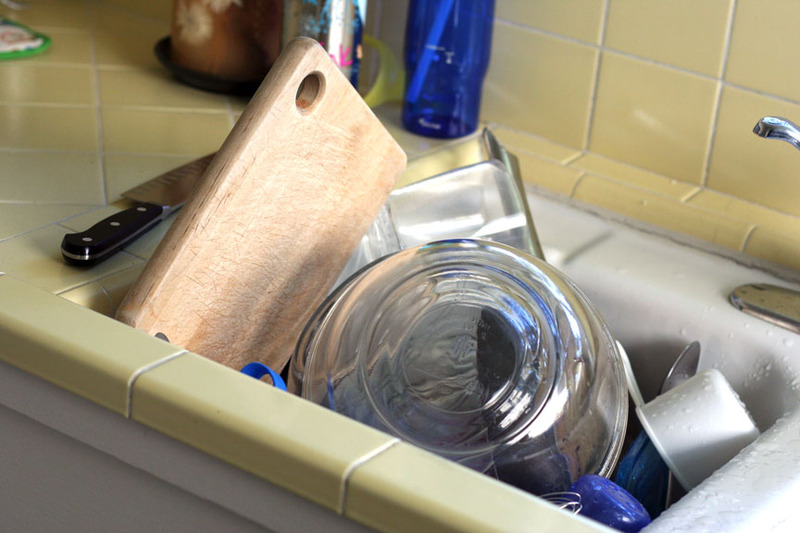 Yes, I almost always have a sink full of CLEAN dishes. While I hate doing dishes SO much, I usually manage to get them washed. But for some reason I have a mental block when they reach this state. I just can’t bring myself to grab a dish towel, dry them off, and put them away. It’s weird. I know. Whenever we have guests, they’re just confused. I invariably find dirty dishes stacked on top of the clean ones. Because, honestly, have you ever seen a sink full of clean dishes? Am I the only one? Nate hates it. But after nearly 10 years of marriage, this is one battle he’s given up on. Smart man. And if a sink full of clean dishes is NOT the bane of your kitchen existence…I’m dying to know what is. Fess up! We’re having tacos tonight, complete with delicious guacamole. But my avocados aren’t quite ready. Close, but not quite. Which brings us to today’s Kitchen Tip! How to speed up (and stop) the avocado ripening process! 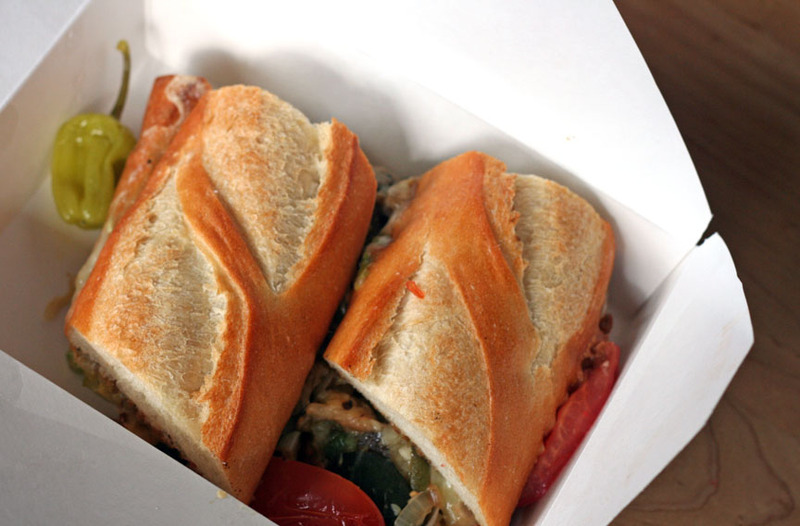 Put your avocados in a brown paper bag. 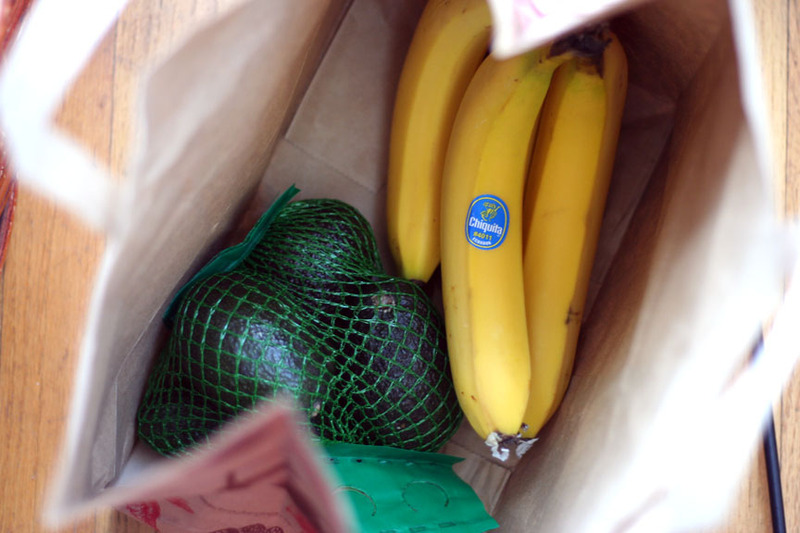 The gases that ripen the avocado get stuck in the bag and help speed things up. I clip the bag closed with a Chip Clip to “seal” it. Store your avocados near bananas. Bananas also let off those same gases that ripen the avocado, so they can help things along. What if your avocados are perfectly ripe but you don’t need them for a few more days? Here’s how to STOP ripening. Place avocados in the fridge. That’s it. Easy Peasy. In case you are wondering, putting avocados in the fridge does not hurt or change them (unlike tomatoes, which should NEVER go in the fridge). One thing that has been so fabulous about having this blog is “meeting” all of YOU! I love the sense of community and the many friends that I’ve picked up along the way, friends I’ve never actually met in person. Lucky for me I had the chance to meet three of my dear blogging friends last week! Marie from Make and Takes, Allison from Petit Elefant and Lindsey from Cafe Johnsonia. I knew they’d be amazing women, but they exceeded my expectations. If you haven’t been to these ladies’ blogs, go check them out here and here and here. You’ll love them. Thank you Lindsey, Marie and Allison for a perfectly lovely afternoon! Add a swig of oil to a frying pan and heat over medium heat. Cook onions for a few minutes then add the sausage and cook until no longer pink. Let the sausage stay in larger chunks rather than totally breaking it apart as it cooks. Drain off excess fat. While the sausage and onions are cooking, bring chicken stock to a boil in a large pot. 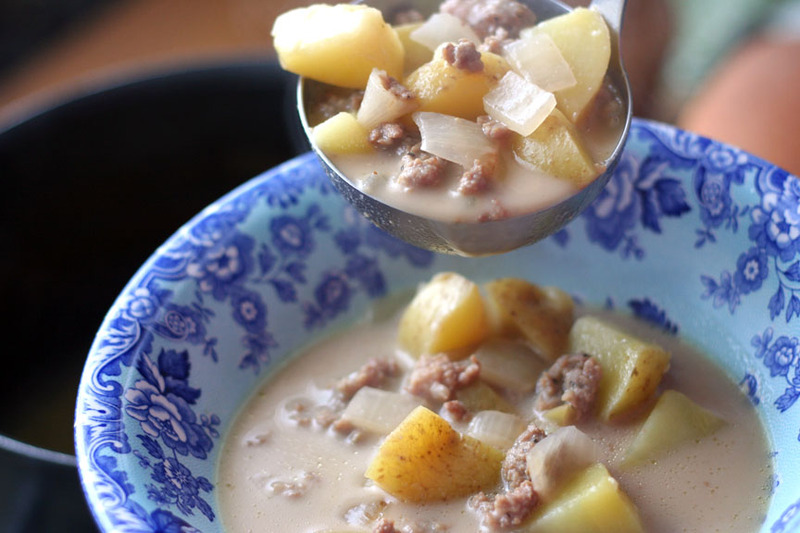 Add potatoes, reduce heat to medium-high and simmer until potatoes are just turning tender. Add the cooked sausage and onions to soup. Add the cream and butter. Stir until butter is melted. Add the vanilla and balsamic vinegar right before serving. Sprinkle pepper over the top, taste and add more salt and/or pepper as needed. Congratulations, ladies! 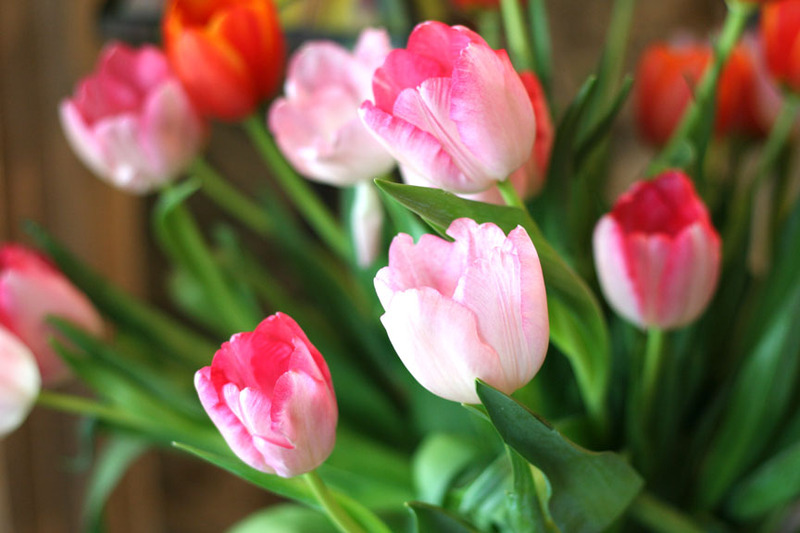 Have fun spending your $100 ProFlowers giftcards! Big thanks to ProFlowers, once again! I went to Utah last week for a QUICK trip. The brevity of the trip didn’t stop me from eating more Provo Bakery donuts than any person should eat in a year. Or ever. Come to think of it, my trips to Utah always involve me eating oodles of delicious (and usually not so nutritious) food. I love it! The last few weeks have been GREAT in the way of menus…I love how many people are planning and posting! Keep it coming…please share your menu for the week! Valetine’s Day = CHOCOLATE! Which is why I must draw your attention to this amazing dessert. 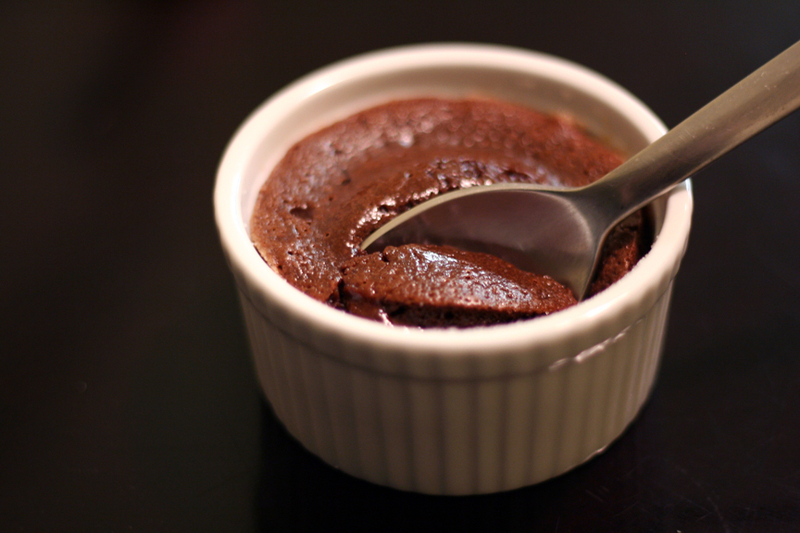 Mini Molten Chocolate Cakes. If you’re looking for the perfect dessert for Valentine’s Day, look no further. You’ve found it. I wrote a post on this dessert last year, so click on over for tips and explanations. And if you’re looking for even more chocolaty inspiration, check out the 14 Days of Chocolate over at Everyday Food. Yum.